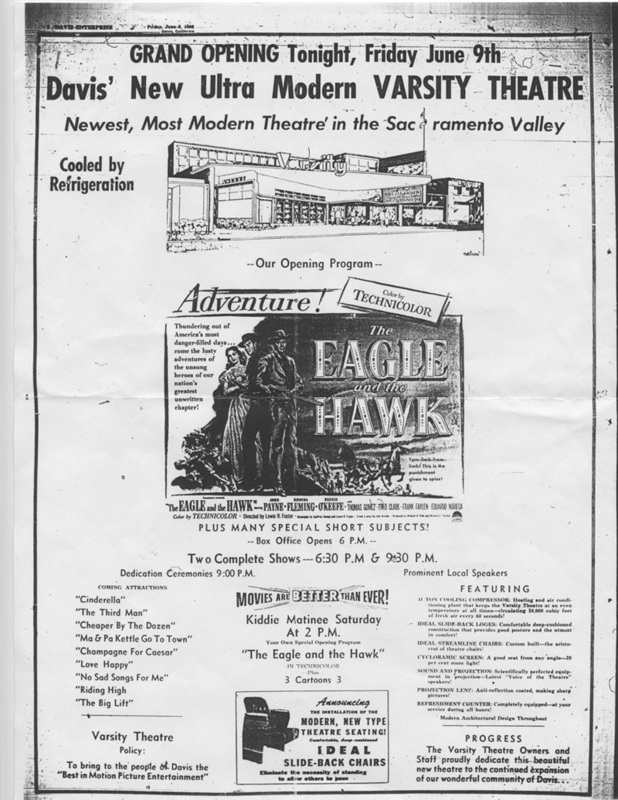 There has been a Varsity Theatre in Davis since 1921. The original Varsity Theatre was built on the site of the Luft blacksmith shop and run by a businessman called Ben Nations. Today the site is home to the Carousel Stationery store on the southeast corner of Second St and F St. Mr Nations left town in the middle of the night leaving the Luft family to run the cinema. They ran it as a family operation until 1949, when they sold it to Westside Valley Theatres, Inc. Westside decided that the only bits of the original Varsity worth keeping were the projection equipment and the name. The Lufts had invested their spare cash in the projection booth, but neglected the rest of the building. 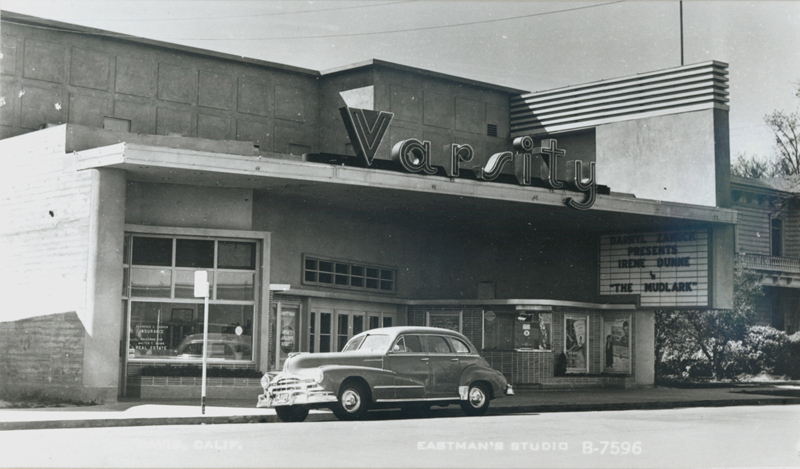 Westside Valley Theatres bought the Luft’s rose garden and started building the new Varsity in 1949. The architect was William B. David, who is responsible for the look of many cinemas in northern California, including the Tower Theatre in Sacramento and the Eureka Theatre upstate. The original theatre featured art deco murals of agricultural scenes by Santocono of San Francisco. 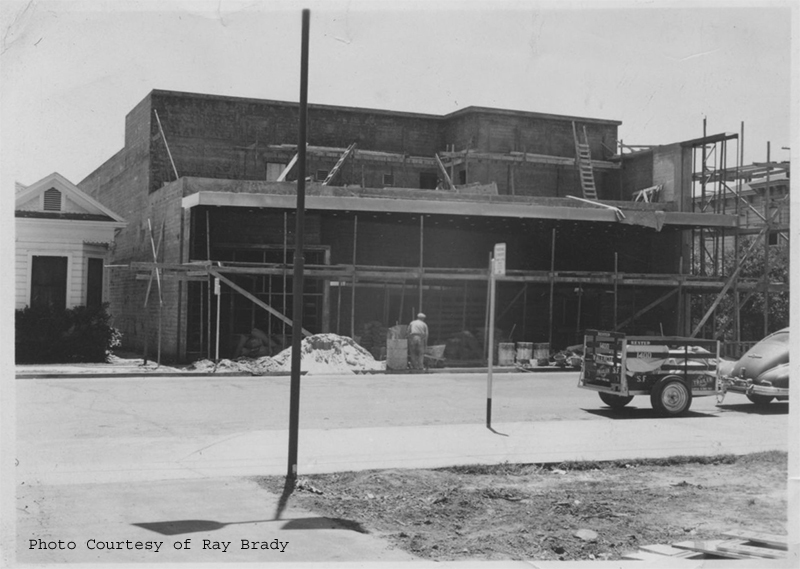 On opening night, June 9th 1950, the theatre was not finished. 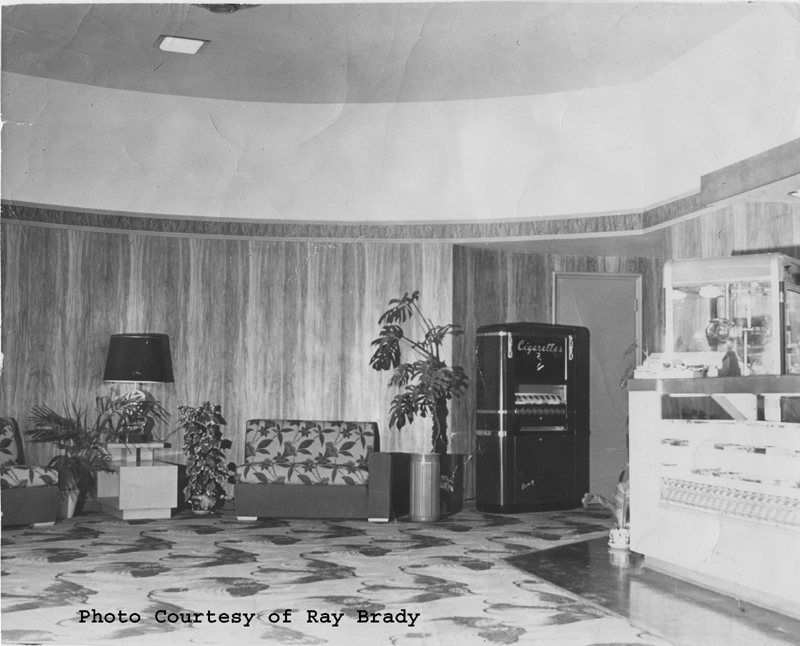 The terrazzo floor had yet to be laid, the water fountain in the lobby did not work, and the curtain motor was not functional so the curtains had to be tacked back. 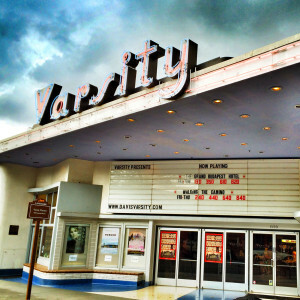 The first movie to play at the Varsity was “the Eagle and the Hawk”, starring John Payne and Rhonda Fleming. 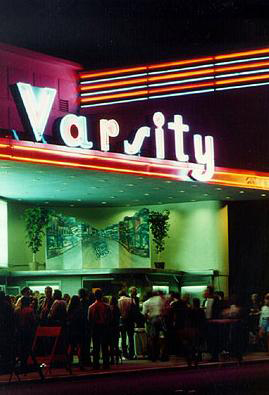 The Varsity is a late example of what is known as Streamline Moderne, a style related to Art Deco, which was influenced by 20th century manufacturing techniques. The moderne style strove for a modern and artistic expression to complement the new age of machines and progress. A focus on the future rather than the past was the style’s principal characteristic. Moderne buildings were designed with an emphasis on smooth curves and horizontal lines to give a feeling of speed. Various moderne features are apparent in the Varsity’s facade. The overhang angles out from the left hand side and is embellished at night with horizontal lines of red neon. Below this, the front wall of the theatre angles backwards to mirror the overhang before curving smoothly around to meet the extremity of the right-hand wall. The horizontal line formed by the top of the doors is continued by the chrome trim on the roof of the curved box office. On the roof, the “tower” at the right features alternating horizontal bands of red and blue neon. Throughout the 60’s and 70’s movie audiences started to dwindle. In order to perk up the box office Westside Valley decided to show more movies per week at the Varsity. In 1976 they spent $100,000 to split the original single screen into two separate auditoriums. The Varsity re-opened February 11th 1976. 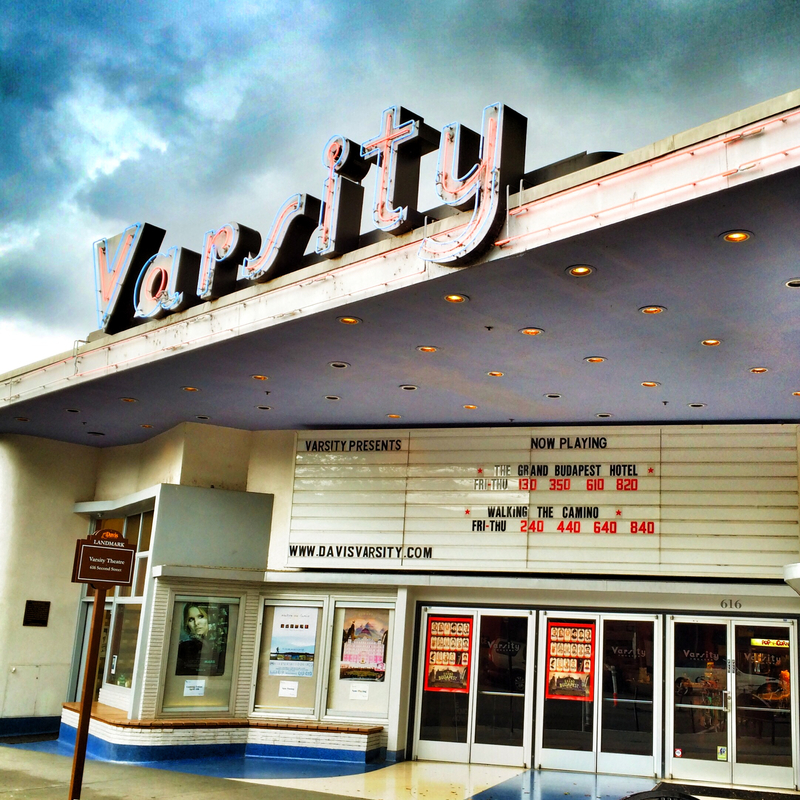 By 1990, the Varsity Theatre was no longer able to keep up with the demands of mainstream film distribution. The city council gave permission for Phil Harris’ Signature Theatres (who took the Varsity over from Westside Valley) to build two new cinemas in town. Harris no longer needed the Varsity, and it was proposed to redevelop the site as office buildings. Dave Rosenberg, mayor of Davis at the time, proposed to save the Varsity from demolition by turning it into a performing arts space. 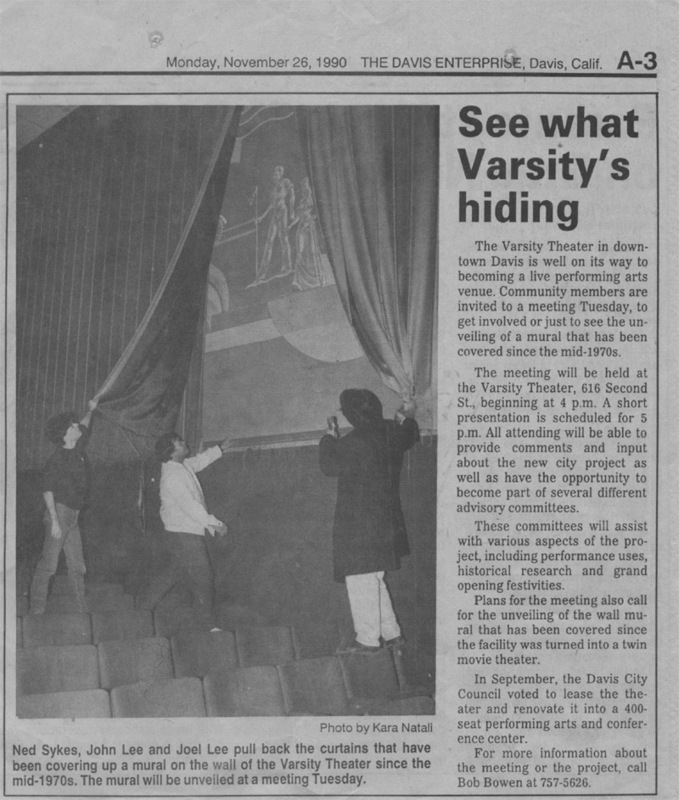 In 1990 the Varsity showed its last movies (ironically titled: “Taking Care of Business” and “Flatliners”) and the City began its lease. 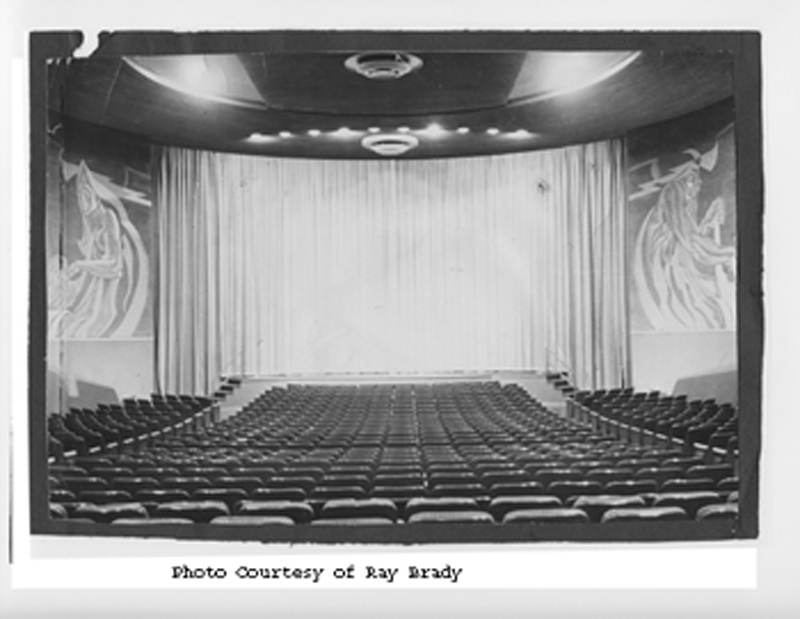 A stage was built in front of the original screen, the seating capacity was roughly halved, the concessions stand was removed, and the art-deco murals from the original theatre were removed as part of asbestos abatement. 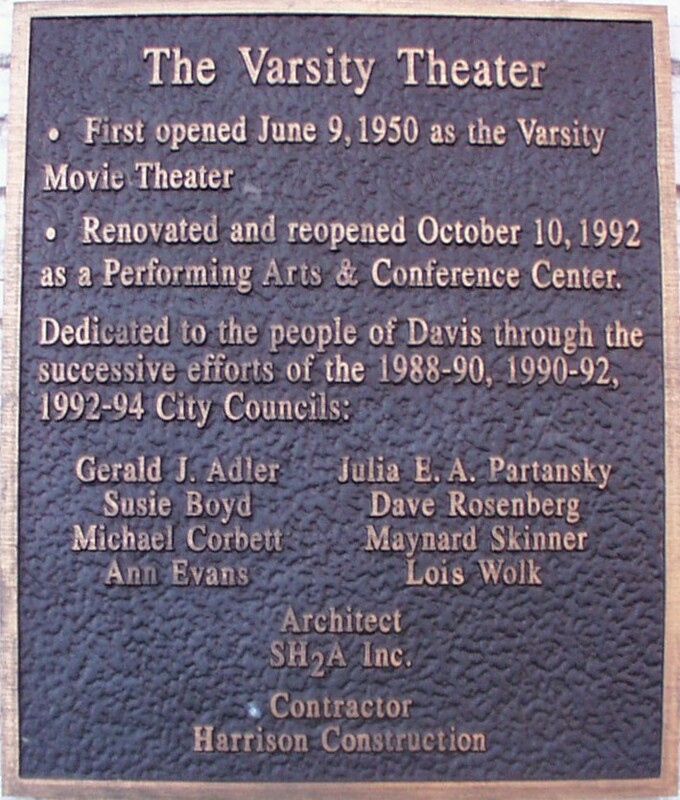 Davis Varsity re-opened on October 10th 1992 and operated as a community theatre for 14 years. During this period, the city of Davis acquired the building. Even though Davis Musical Theatre Company produced around ten musicals per year, the theatre was frequently dark, and the City Council resolved to find a way for it to be in use every night of the week. 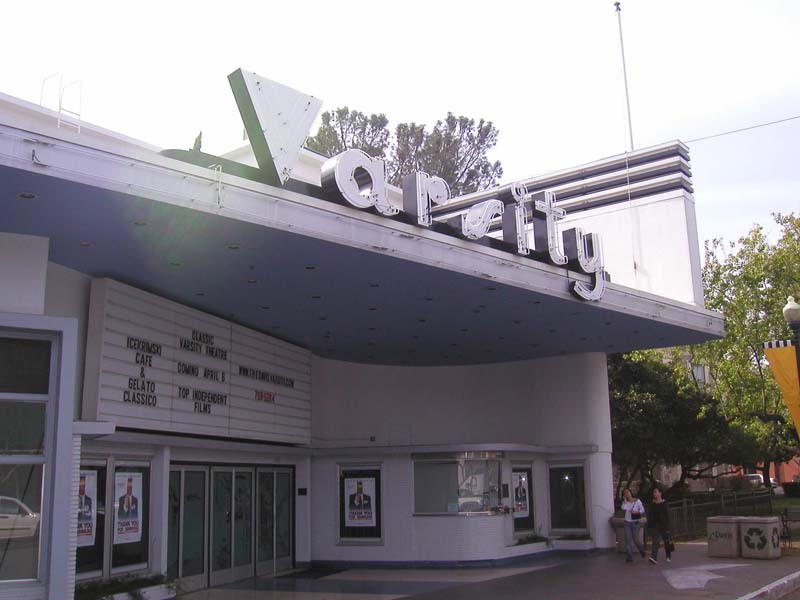 On October 25th 2005, the City Council agreed to lease the building to Jon Fenske and Sinisa Novakovic to run the Varsity primarily as a single-screen art house cinema. 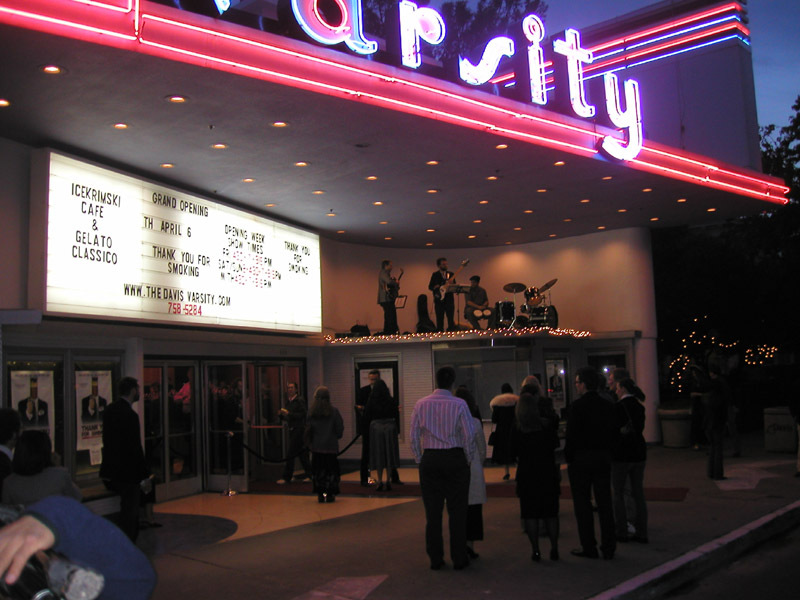 The Varsity Theatre officially re-opened on April 6th 2006. The second screen in a 97-seat stadium auditorium was added to the Varsity on February 5th, 2010.